Kellyanne Conway: Trump's Twitter Likes And Fox News' Ratings Prove That The Public Supports Kavanaugh - Joe.My.God. “If you look at the president’s tweet after Judge Kavanaugh testified he got over 300,000 likes within 24 hours. That’s a lot of likes for a presidential tweet and your own prime timeline-up on that same night Thursday following the historic testimony, you had 5.3 million viewers in your prime timeline-up. 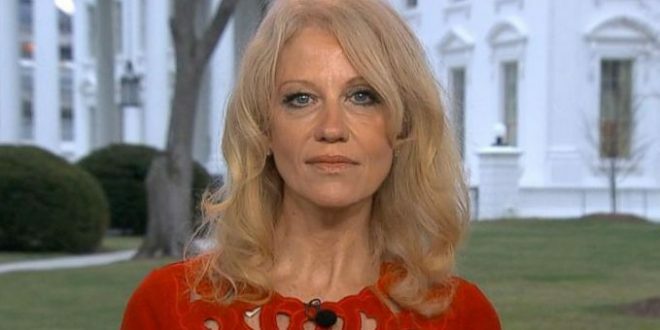 But it tells me that the president focusing on the Supreme Court and that folks who care about the Supreme Court are very focused on what happens here and many are disgusted with the process, as you know.” – Propaganda Minister Kellyanne Conway, speaking this afternoon on state television.